Bond by Sir William Purves to Sir David Hay, one of his majesty’s physicians, for 1,000 merks. Purves family origins are uniquely circumscribed to the South East regions of Scotland and the family mostly remained in the area until the 19th Century when emigration to Canada occurred and in the later parts the 1800′s when migration to Newcastle and Liverpool/Manchester started because of decline of the rural economy and industrialisation ‘opportunities’. The spelling variant Purvis appears to be an Anglisation of the name during the 18/19th Century during early migration south to England with Purves being the norm from the 16th Century in Scotland. The first use of surnames in the Western world started with tax and feudalismis a set of reciprocal legal and military obligations among the warrior nobility, revolving around the three key concepts of lords, vassals and fiefs (click for more) in Normandy in the 11th Century. In Southern Scotland surnames became common by the 12th Century with the influx of the Anglo-Norman nobles with King David I. However researching families this far back is fraught with problems mostly due to the lack of documentation. Where there is documentation it is often in Latin and the general lack of education means even those who can write often spell surnames with a wide variation- please see my page on Purves spelling variation. The name has an ‘occupational’, or role, origin stemming from the “the collection or requisition of provisions for a sovereign” Purveyanceis the feudalis a set of reciprocal legal and military obligations among the warrior nobility, revolving around the three key concepts of lords, vassals and fiefs (click for more) right of the Crown to requisition goods and services, purchased on credit, for royal use whilst his household travelled through the country or during military campaigns (click for more) (purvea(u)nce, purvya(u)nce in middle English and purveance in old French). Thankfully the Purves family is some importance throughout the generations and there is much documentation naming individuals and their families. However this documentation is very dispersed and the origins for the idea for this web site is to make me organise it and make it publically available . Southern Scotland is of course famous for the Border Reivers and Purves’ do not get a mention in fact nor do the Douglas’ nor Home’s (families with very close ties with the Purves’) – as a consequence the true relevance of Purves’ to Scottish and Border history has been lost – something this web site aims to correct. Our starting point is the first Purves written about “Witti Purueis carta de Mospennoc” (or in English William Purveys of Mospennoc) is “carta”; Tenant-in-Chiefin capite or tenant-in-chief, sometimes vassal-in-chiefin capite or tenant-in-chief, sometimes vassal-in-chief , denoted the nobles who held their lands as tenants directly from king or territorial prince to whom they did homage, as opposed to holding them from another nobleman or senior member of the clergy. Other names for tenant-in-chief were captalin capite or tenant-in-chief, sometimes vassal-in-chief , denoted the nobles who held their lands as tenants directly from king or territorial prince to whom they did homage, as opposed to holding them from another nobleman or senior member of the clergy. Other names for tenant-in-chief were captal or baronin capite or tenant-in-chief, sometimes vassal-in-chief , denoted the nobles who held their lands as tenants directly from king or territorial prince to whom they did homage, as opposed to holding them from another nobleman or senior member of the clergy. Other names for tenant-in-chief were captal or baron.. or baronin capite or tenant-in-chief, sometimes vassal-in-chief , denoted the nobles who held their lands as tenants directly from king or territorial prince to whom they did homage, as opposed to holding them from another nobleman or senior member of the clergy. Other names for tenant-in-chief were captal or baron.. , denoted the nobles who held their lands as tenants directly from king or territorial prince to whom they did homage, as opposed to holding them from another nobleman or senior member of the clergy. Other names for tenant-in-chief were captalin capite or tenant-in-chief, sometimes vassal-in-chief , denoted the nobles who held their lands as tenants directly from king or territorial prince to whom they did homage, as opposed to holding them from another nobleman or senior member of the clergy. Other names for tenant-in-chief were captal or baronin capite or tenant-in-chief, sometimes vassal-in-chief , denoted the nobles who held their lands as tenants directly from king or territorial prince to whom they did homage, as opposed to holding them from another nobleman or senior member of the clergy. Other names for tenant-in-chief were captal or baron.. or baronin capite or tenant-in-chief, sometimes vassal-in-chief , denoted the nobles who held their lands as tenants directly from king or territorial prince to whom they did homage, as opposed to holding them from another nobleman or senior member of the clergy. Other names for tenant-in-chief were captal or baron.. (or vassel) to Alexander II and during his reign (1214-1249) William sold the Monks of Melrose a right of way over his land. A William, likely his son, is named in the Ragman Rolls in 1296 as “William Porneys – tenauntz le Roi du counte de Pebbles” – this William also has a Royal Charter for land. In addition the Ragman Rolls also contain “William Poureys – del counte de Berewyk”, perhaps William Purveys of Mospennoc grandson? This William witnesses a charter in the same year by William de Billingham relating to the lands of Fleurs, near Coldingham as “William Puruys”. William de Douglas the de Douglas brothers worked very closely together and with Archibald witnessing William of Mospennoc’s deal plus the subsequent many Centuries of connection between the Purves’ and Douglas’ makes the proposal. William de Conigburg, Dominus de Stapilgorton whose daughter Alicia married John Fraser of Drumelzier [Morton Registrum, Vol. I, 9, p. 8.] 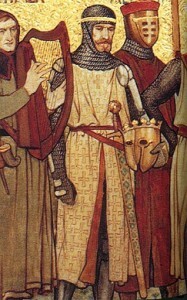 and Son William de Conigburg born 1180 may have taken on the role of Kings purveyanceis the feudalis a set of reciprocal legal and military obligations among the warrior nobility, revolving around the three key concepts of lords, vassals and fiefs (click for more) right of the Crown to requisition goods and services, purchased on credit, for royal use whilst his household travelled through the country or during military campaigns (click for more). 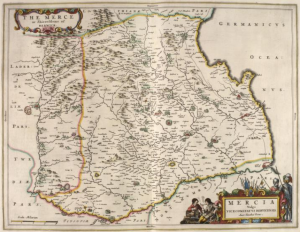 If these conjectures are not true then William of Mospennoc would probably also be a descendant of an important Flemish knight because his connections with the Douglas, Frasers and others in Tweeddale area. Ian, I am also a student of our family history. My great-great-great-great-grandfather George Edward Purvis came to Virginia from the Borders region of Scotland in 1739. In 1969, a cousin of mine, Mrs. Alice Simpson Oliver, compiled a geneaology from that year forward. I am currently posting diary entries from my great-grandfather, Joseph Edward Purvis, who was captured at the Battle of Gettysburg and incarcerated as a POW at Fort Delaware. He began his diary on the date of his capture 150 years ago on 3 July 1863. Check out my Facebook page above for the daily entries, they may interest you. I am a Purvis and my ancestors left Scotland and sailed from England to Barbados, and Virginia. They were settled in South Carolina in the 1700s. Also they left Novia Scotia and settled in founding Purvis, New York,. They were in the Americas long before the 1800s. From what I understand my branch of the Purvis family married into the Douglas, Stewart, Home , Hume and Campbell families and the family originated out of the de Forbes family (Forbes) of France. Phaedra, can you give us some information on your statement about the de Forbes family (Forbes) of France. The name Purves came over to England first with the Norman invasion. I would be interested to hear from anyone with insight into tracing the roots of this further as variations of this name are scattered around France as Pervez Parvez Perez Parvis Parviz. The derivation of some of these are traceable back to middle eastern names. Parviz is common in former Persia and Pervez occurs in Pakistan. Take the v out of Pervez and you have Perez traceable back to Jewish roots. As refugee communities spread names were changed to hide identities that invited persecution. Hence jewish families with Perez would change to Peres in Spain during the time of the Inquisition and assume the christian name linked to apostle Peter.. French families that took refuge in Scotland would have found the Purves name already well established because of Norman roots. Mark, I also thought the name was of Norman origin however reviewing the knights of the Anglo-Norman Kings (1066-1154) I can find no evidence. I have also been following the heraldry as this is much older than surnames and so far found links to Flemish families but nothing firm and nothing in Norman Knights or the Knights of David I. This is not say there is no genetic origin to these knights just no evidence of name or heraldic connection – I have a boringly large collection of documents some of which have been transcribed and some even translated. As it is clear that William Purveys of Mospennoc (the first documented Purves) was a Purveyance to Alexander II this would seem to be the origin of his name. The phrase Purveyance was from the old french term purveance with a similar meaning in feudalism and as such it is perhaps no surprise there are other derivations (probably with no genetic link) in French and other territories with links to the Crusades. The close links between William Purveys of Mospennoc and the Douglas family is the strongest link I have found to date. His farther would also seem to be named William if the subsequent two generations listed in the Ragman Rolls are to believed – but who was he (aside from being a knight of some importance) and did he use a surname (maybe not as this about when they started in Scotland!). What I need are more charters from the Peebles area around 1226 however I have found no source of any in the area – if anyone has any ideas please say. I am descended from Sir William Purves (& further back). I’ve had my DNA run, and I show NO Jewish DNA in my roots (nor any Native American DNA). Could be wrong, as I can find a HUGE set of trees that span the entire globe, with Purves in EVERY Continent! The ‘Master’ of this site was INDEED related to us. We were in contact in the early 1990′s, and he said he came to the US to Purvis, MS (established by my ancestors), and visited with my old Aunts! That was so GREAT to hear…I think his visit was in the 1960′s…as they passed away shortly after that. I DO remember Aunt May Purvis. I am the great-great-great-great-great grandson of John Purves, who sailed to Charleston, SC in 1765 on the Merniva of Dundee. He settled outside of present day Edgefield, SC and at one time owned up to 3,000 acres and 30 slaves. He served as a Lt Col and Adjutant of the SC Militia during the Revolution. He died at a relatively young age of 46, probably from “swamp fever” acquired during the Florida campaign. As far as I can determine at this juncture, John was the great-great grandson of Sir William Purves of Purveshaugh (1623-1693), 1st Barnoet of Nova Scotia. His son John (the eldest) sold his half of the inheritance to his brother and left for Alabama several years later. He probably fought in the War of 1812 as we have records pertaining to a John Purves from AL stating such. John(2) later moved to Mississippi and became a farmer. One of his sons, James, is my great-great-great grandfather fought in the Civil War and he and his brother left Mississippi and founded the town of Purves, Texas where he served as blacksmith, postmaster and barber. He is buried in Erath Cemetery, TX. James’ son Benjamin Franklin Purves/Purvis stayed in Mississippi and this is where the spelling of the last name changed. One could assume they were illiterate as they were poor sharecroppers at this point and the draft registrar simply wrote what he heard, thus changing the spelling from E to I. His son, George Wesley Purvis, lived his life in Mississippi, dying at the ripe old age of 99 in 1970. My grandfather, Theodore Bradley PurvisSr., spent a life in the US Navy, retiring as a LtCdr to farming in Plant City, FL. My father, Theodore B. Purvis, Jr. Capt USN, also spent a career in the US Navy retiring in 1969. He passed away two years ago last December in Lakeland. FL. I am a retired USAF Major and currently reside in Toano, Virginia with my wife Avril (ne: Jarvis from Birmingham, UK). I am a Captain with United Airlines and fly the Boeing 757, often to the UK. I cannot get to your site, as I am not registered at a Ancestry.UK member. I’d love to see what you have, if you have your information on another web page. I am also, like Nathan, a descendant of the 1st John Purvis to come to the US from Scotland. His son John II (my 3rd gr. grandfather) moved to Alabama, married, then moved to MS to purchase land. One of his sons, Thomas Melville (Melvin?) married Dorothy Abney, purchased a great deal of land and ‘founded’ the town of Purvis, MS, One of his sons, John Boardman, married Nancy Baxter, and he was the FIRST Mayor of Purvis, MS. John Boardman’s youngest son, Robert Edgar was born 14 Feb, 1893 and HE was my grandfather. Unfortunately, he passed away when I was 5 years old. The Purvis all seemed to have HEART problems, as R.E. passed away from a heart attack, and both my father (John Abney Purvis) & his brother (living) suffered from heart problems. BUT, due to a GREAT doctor, we spared them from passing at an early age. The Abney line is very historical, and I’m proud that my Dad was given that middle name. The Abneys were members of the line of people who signed the Magna Carta… We DO have a new young Purvis in the family, born 2 years ago. I’m so happy about that, as neither my brother nor my cousin had children. My part of the family traces to Glasgow where my GGF Samuel Purvis was an iron molder. He and wife (probably his 2nd), Elizabeth Martin Balfour Purvis, a widow with two children, came to the US via either NYC or Canada and settled in Cleveland. Don’t know if he came from Ulster or Scotland, but suspect the former. I’ve been tracing my mother’s side (Heron, Hearne, etc), which is interleaved with primarily Borders people and Scot and English nobility. Wile searching I came across mention that Purvises may have been Forbes or, as noted in piece Electric Scotland on the Campbells could trace back through them. Below is an excerpt from that piece that you may find interesting. Another thought: I suspect that my Purvises likely departed for Ulster after 1603 when James I was settling it with other than Gaelic Irish. Might anyone have a clue about any listing of such emigres? I am trying to find information on William Edward Purvis (1916 -1993), my grandfather and our ancestral lines. My father was Richard Anthony purvis (1943-2011) born inHertfordshire England. I am not sure where to begin – can you point me in the right direction? What is the definition of Sopieboy? Do you know of any Purvises who went to Ulster to resettle, escape, or whatever during the 17th or 18th centuries? Samuel, I am afraid James died in Scotland (see http://trees.ancestry.co.uk/tree/15610355/person/926801370) whilst I have not found his death certificate I do have a Loan Discharge dated 31 Oct 1705 which says James had died. If he had emigrated the loan would have been discharged in a different fashion. Sopieboy means “Soppy Boy” which can be ironic (i.e. big and tough) or mean he was effeminate. Ian: Thanks for the definition. I hope he was big and tough. I’d be interested on your take on the following. Several old family pedigrees link James Purves with George Purves as father and son, but there is clearly a conflict in their dating. Documentary proof of their relationship has yet to be found. Nevertheless in the 19th century, descendants of the Darsham Purvises were accepted as kin at Purves Hall; also, Captain George Purvis (1689-1740), the son of this George Purves, was in 1721 created a Burgess and Guild-Brother of Edinburgh, implying a recognised link with Scotland. As I see it, George I of Darsham could not be the son of James Purves of Purveshaugh aka Sopie Boy. George I was said to have departed the Borders for the RN circa 1670, I’d guess as a midshipman in training around the age of 14, which would put his birth date around 1656, two years before Sopie Boy was born. I suspect George I wasn’t a victim of a press gang, but had help from the gentry in his entry to the RN—most likely from the person I believe to be his father, Andrew Purvis of Purveshaugh (1628-1665) husband of Marion Aikman whom he married 16 February 1656. Andrew was the son of Robert of Abbeyhill and Margaret Douglas. The dates here make sense. George I of Darsham would be Sopie Boy’s first cousin. George I had an eye for RN politics. He married Margaret Dakins Berry (widow of a brother to an Admiral Berry). Descendants were several captains and admirals in the Royal Navy. Although these folks are not direct ancestors I became hooked on the investigation because I am a retired US Navy captain. I was looking through an old family tree folder made by my late grandfather, for his maternal side (Davis-Scott), and it seems to stem all the way back to Captain John Scott in the early 19th Century. I was fascinated to read that he might have been the son of the Admiral of the Blue. As I tried to follow the family tree back beyond John Child Purvis, I too stumbled over the dating for George of Darsham and James of Purvershaugh. If some websites are to be believed, George was born 8 years before his own supposed father was christened! Is there any hint as to George of Darsham’s actual paternity?Perhaps a son of Sir William, or one of his brothers? I tried to read up on Andrew of Purveshaugh, married to Marion Aikman, but the transcript of a book, “The revenue of the Scottish Crown” suggests that marriage was issueless. Last evening the books I ordered from Amazon came: “Admiral of the Blue” about Admiral John Childs Purvis and “Soldier of the Raj” about Robert Fortescue Purvis, the admiral’s son, both written by Iain Gordon who is a Purves many times removed. Mr. Gordon claims George I is a son of Sir William, 1st Bart. I revisited the web and noted that an unnamed son of Sir William was christened on 19 July 1657, a date that could make sense for George I. So, just possibly, he could be brother of Sopie Boy rather than a cousin…. Maybe the Purvis blood is behind my lifelong fascination with things naval and bagpipes. I’ll be interested in your comments once you get back to your background materials in UK. Namibia is a photographer’s paradise as you’re proving. Great stuff! I’ve been in touch recently with Ron Dunning who has done extensive work on the Purveses. He’s related to the family through the Darsham and Royal Navy Purvises. It was through Ron that Ian Gordon got much of the Darsham lineage for his books. I believe it would be beneficial if we got our info together. I’ve contacted him about, inter alia, Sopie Boy and forwarded copies of the royal charters given to Wm. Purvis, 1st baronet and subsequent transfer to Sopie Boy and then his son, James (1690-?). If you want copies I can forward via this site or to your email address. I am also a descendant of Sir William Purves. He was given a baronetage/baromcy in Novia Scotia. He was known as William Forbes before then. Not only did his descendants live in Nova Scotia and spread in the Northeast from there, other descendants such as my 7x great-grandfather left Scotland via ships from England and emigrated to the colonies. Some of my ancestors left Scotland in the late 1600s because of the “great-potato famine”, which not only affected Ireland but England and Scotland as well. Please note there were two John Purvises that fought in the Revolutionary War. Col. John Purvis lived in “Old District Ninety-Six”, South Carolina part of which became Edgefield County, SC., encompassing present day East Augusta, SC, Augusta, GA, and I believe Aieken, SC. Lt. Col. John Purvis (my direct ancestor) emigrated from Scotland via England, and Barbados to Virginia and from there to Craven County, SC. Historical Craven County was broken into several smaller counties including Chesterfield County.Lt. Col John Purvis fought in the Revolutionary War along with his sons Gilbert and Alexander. Many Purvises were turpentine farmers/distributors, and they left the Cheraw, Chesterfield County area and migrated to Alabama where the type of pine trees they used in their trade grew. Col John Purvis and Lt Col John Purvis were cousins. I have a letter documenting this fact somewhere in all my research papers. Melville Purvis was a lad about 12 when he left the Cheraw area with his family and traveled to Mississippi. The eventually resettled in Danley’s Crossing, Coffee County, Alabama as did my great-father John Purvis along with his brother Robert. They all were turpentine distributors. They left Chesterfield with their cousins William E and “Buck” Campbell who were born in Nova Scotia. They joined Purvises that were already in Alabama. For me, the ancestry gets rather foggy between James (Sopie Boy) and my GGF who arrived in the US circa 1870 from Glasgow where he was a laborer in a steel mill. He continued the occupation in Cleveland. I’m familiar with the line of John Purvis who came to 96, SC. I lived near there (Laurens, SC) for almost ten years and can’t imagine how anyone would end up there in the 17th century. That aside, do you know why John Purvis left Scotland? And…as the two Johns were cousins, who were their fathers? Thanks and Merry Christmas. The extended Purvis Family did well in Alabama and populated areas such as Opp, Elba, Andalusia, Enterprise, Curtis, Brooksville and the surrounding towns in Coffee, Covington, and Escambia, AL. Escambia County AL was divided in two giving birth to Escambia County Florida. You’ll find a lot of Purvises there. Melville Purvis lived with his family in Coffee County, Al until he was 19 when he returned to MS. There he amassed many acres of land. He offtered land to ansy Purvis that wanted to develop a homestead and many. many Purvises relocated to MS from SC. When a railroad company wanted to build a railroad through land owned by Melville Purvis he gave them land to build it. A town sprung up around the train depot and the railroad company named the town Purvis. There is also a Purvis NY, Purvis TX, and I believe there was Purvis NC. My thanks to you for this website and all the work you have done in researching Purvis. I was born in Monroe, Louisiana in 1936. With the aid of Ancestry .com I have been researching Purvis and have traced my Purvis lineage back through Mississippi, South Carlolina, Virginia and Maryland to William Purvis of Monymusk, Aberdeenshire, Scotland. i have a question as to how the Forbes name and the Purvis name got linked. Can you or anyone else clarify this for me? Sacred to the memory / of Captain JOHN PURVIS, of the First, or Royal Scots Regiment, / who was mortally wounded on the night of the 8th of March, 1814, / whilst gallantly leading a division of that brave regiment / to the charge, at the seige of Bergen op Zoom. / He deservedly possessed the regard and esteem of / his brother officers, and died, much lamented, / on the 16th day of the same month, at Rosendaal; / where his remains were interred. / Thus in the 44th year of his age, / after a service of 29 years, in defence of his country, / fell a brave man, a sincere friend, and a most affectionate husband; / whose greatest pride was to emulate others, by the honorable / and zealous discharge of his duty. / This humble tribute of respect to his beloved memory, / is erected by Alderman Browne, brother to his afflicted widow, / whose loss is the more severe, / from the recollection of / his private worth. Like Theodore B. Purvis III (Brad)..I am the 4th great granddaughter of John Purves, who sailed to Charleston, SC in 1765 on the Merniva of Dundee. He settled outside of present day Edgefield, SC and at one time owned up to 3,000 acres and 30 slaves. He served as a Lt Col and Adjutant of the SC Militia during the Revolution. He died at a relatively young age of 46, probably from “swamp fever” acquired during the Florida campaign. As far as I can determine at this juncture, John was the great-great grandson of Sir William Purves of Purveshaugh (1623-1693), 1st Baronet of Nova Scotia & 1st Solicitor of Scotland. (This has been tracked back by my cousin, who has compiled a 200+ page hard cover book on the Purves/Purvis Family from 1176-2013-Scotland to USA). Col. John’s son, John II,(the eldest) sold his half of the inheritance to his brother and left for Alabama several years later. He married Elizabeth Lovett in Alabama, and they moved along to MS, where he amassed his land (per Phaedra above). His son, Thomas Melville Purves, was the actual owner of the majority of the land, and founded the town of Purvis, MS (There were OTHER Purvis relatives who came west, but John II’s family decided NOT to cross the MS River. Those that DID, established the town of Purvis, TX…now a small town, but where many of my relatives ended up). Thomas Melville Purves’ bust appears next to the courthouse (I believe) the another replica is in the DuPont Museum. One of his 8 children was John Boardman Purves (1850-1921), and served as the FIRST Mayor the Purvis, MS. It was renamed to Purvis when the railroad came thru & mistakenly put up a sign reading ‘Purvis’, rather than’Purves’. John Boardman had 12 children, They primary family lived in Purvis, MS for all their life.. The Purvis brothers seemed to intermarry the daughters of William Pitt Chambers & Sarah Ann Robertson (who came from a LONG LINE of renowned Baptist ministers) over in Purvis, MS. My gr. gr. grandmother was Lula Chambers, whose sister, Nina, married Oliver Ottis, child of John Boardman; Nina’s sister, May, married Charles Elmer Purvis (Oliver’s brother) Lula Chambers, married a Hendrix, but her DAUGHTER, Mabel, married Robert Edgar Purvis, the youngest child of John Boardman Purvis. So my grandparents were Robert Edgar Purvis & Mabel Hendrix. My father, John Abney Purvis, was born in Gulfport, MS, but the family relocated to Shreveport, LA for a short time, then to Bogalusa, LA, where I was born, and now have relatives remaining. Robert Edgar Purvis died of a heart attack at the age of 62, leaving his widow, Mabel, to live a long life of 96 years. Her mother (Lula Chambers Hendrix) came to Bogalusa to live with her towards the end of her life, so I got to know her for about 10 years, but only knew my grandfather for 5 years. Thanks for this site!!! I’ll try to bookmark it! HI relatives, some of whom I already KNOW! Theordore (Brad); Brenda Purvis Pruess did extensive search of documents on our ancestors. We found no direct link to those in Berwickshire or that William.. Col John Purvis was b 1745 and m Eliz Ann Prichard in Charleston. His father was John 1715 m Eliz Melvill, which is important since his great grandson was Thomas Melville Purvis (your Jam and bro William Washinton’s bro) and founder of Purvis, MS. This John (1715) was son of William, Dunbar Parish 1689. His son John JR settled in Jasper Co MS where we found his tombstone. Be glad to converse with you, as. I know some of my ancestors died in E Barnes, Scolland in 1700′s. Do you know names or have photos of any cemeteries that served that area? I am Gerald Purvis, Purvis, MS kin to Purves’ in Purves, Tx and go back to Col John Purves in Edgefield SC. Thomas Melville Purvis IS NOT a Descendant of the Col John Purvis, Gilbert or James Purvis of Chesterfield County. Thomas Melville is the son of John Purvis, Jr and Elizabeth Lovett thus he is a descendant of Col John Purvis and Eliza Ann Pritchard. He married Dorothy Abney. and founded Purvis, Mississippi. My paternal grandmother was a great granddaughter of John Home Purves second son of Sir Alexander Purves 5th Bt. and his second wife Many Home. John Home Purves married Ellen Power, sister of Margaret, Countess of Blessington. Their eldest son also John Home Purves was a Col. in the Grenadier Guards and was Equerry and comptroller of the household of the Duke and Duchess of Cambridge. His grandson Sir John Home Purves Hume-Campbell was the 8th and last Baronet of Purveshall also inheriting what was left of the Earl of Marchmount estate. He died in 1953 without male issue. My grandmother kept in touch with many of her cousins and some of that correspondence is in my family papers. Her great grandfather and Ellen Power separated in the early 1820′s and he took a position as British Consul in Pensacola Florida where he died in 1828. She promptly married Sir Charles Manners-Sutton, Speaker of the House of Commons, later Viscount Canterbury. He was the eldest son of The Archbishop of Canterbury (1805-1828) whose youngest daughter was my Grandmothers grandmother.Her son, my great grandfather married a granddaughter of the Viscountess Canterbury by her first marriage to John Home Purves. Complicated isn’t it. The Archbishop and his wife were also cousins being both grandchildren of the 3rd Duke of Rutland who descends from the Plantagenets. There was a lot of carrying on with with kissing cousins in those days and to further complicate a family tree, my wife and I are 3rd cousins. Enjoy your Purves and Hume/Home research. I’ve got a lot of it documented long before the world wide web was invented.